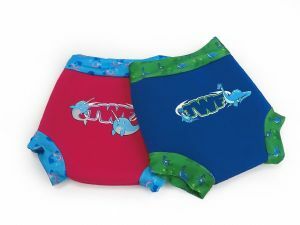 The TWF Nappy Cover has been designed for a safe an secure swim for your baby. The nappy is worn over the top of a swim nappy to provide extra protection, complies with Double Nappy Policy and has been designed for a snug fit to prevent those little accidents entering the water. The nappy is made from soft neoprene with polyester Lycra hems for a comfortable fit and the stretch fabric allows for comfort when splashing in the pool. This nappy is worn over the top of a swim nappy to provide extra protection. Soft, neoprene with polyester Lycra hems for a comfortable fit. Stretch fabric allows for comfort when splashing in the pool. Lightweight fabric ensures your baby is not weighed down in the water. Snug fit to prevent those little accidents entering the water. Machine washable on a cold temperature. Complies with the Double Nappy Policy.